Dain was my first Springer Spaniel - my parents bought her as a puppy when I was 9, and I adored her! She was a black and white Springer, rather than the more usual liver and white; I took this with a Brownie box Camera - not bad, eh? It appealed to my sense of humour to catch her sitting in a wheelbarrow! 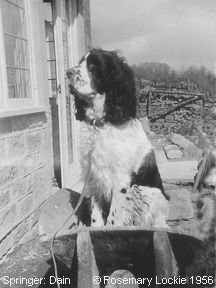 She was one of a litter from Hawkhill Kennels, Eyam, Derbyshire, bred by Judith Robinson (now Judith Hancock). Judith has loved dogs since she was a child too, but has gone in for it rather more seriously than I have, as she breeds English Springers, and shows regularly, at Crufts, and worldwide. She used to - maybe still does - choose names for each litter beginning all with the same letter. Dain came from a litter of puppies with names beginning with a “C” - and her kennel name was Hawkhill Calamity (Cloud and Caution were another two from that litter). Predictably, she was nicknamed Jane (Calamity Jane)! My mum wasn't too keen on the the name Jane, but we thought she'd take to a name which rhymed with the one she was familiar with: I had a school friend with the unusual name of Dain, so that's how her name came about. Mind you, I got rather tired and frustrated of being asked at school about my dog, and telling them her name was Dain, and the response being “Oh, you mean she's a Great Dane?” No, no no!! !